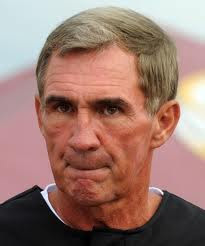 This picture of Washington Redskins Coach, Mike Shanahan shows an absolutely great example of an"Inward Lip-Roll". An Inward Lip-Roll is a classic sign of anger-associated anxiety. When you see this particular lip disappearing act, its maker is trying to control his or her temper. Their fuse has grown short and there is a significant chance that they're about to lose their temper.